Higher, Further, Faster and healthier! 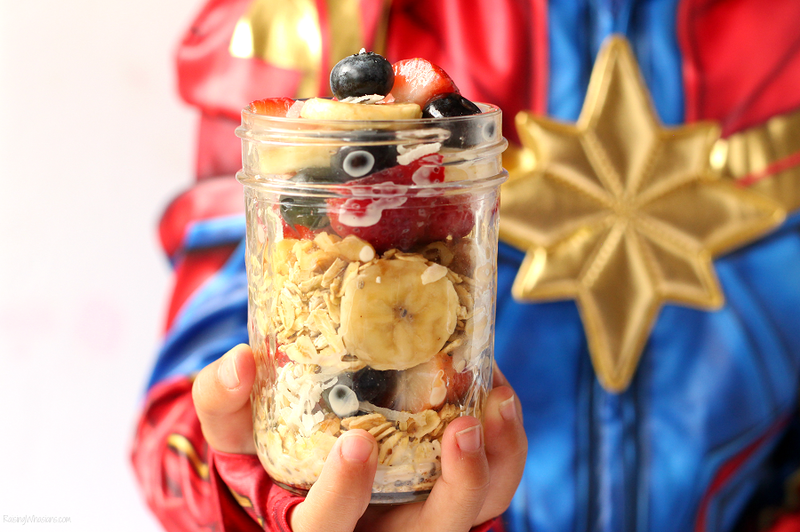 We’re cooking up 4 Healthy Captain Marvel Recipes for Kids to celebrate the newest super hero movie! I am an official ambassador for Dole Fresh. Dole provided me with compensation for my time. All delicious opinions are my own. Higher, Further, Faster and…healthier? YES! Are your kids obsessed with Captain Marvel too? My daughter has already claimed that she is dressing as Captain Marvel for Halloween. And call a snack a “Captain Marvel snack,” she’s all over it. That’s how much she loves the newest and most powerful super hero in the Marvel universe. I love when the new Marvel super hero movies are released because I have yet another way to encourage my kids to eat healthier, with a little super hero inspiration! 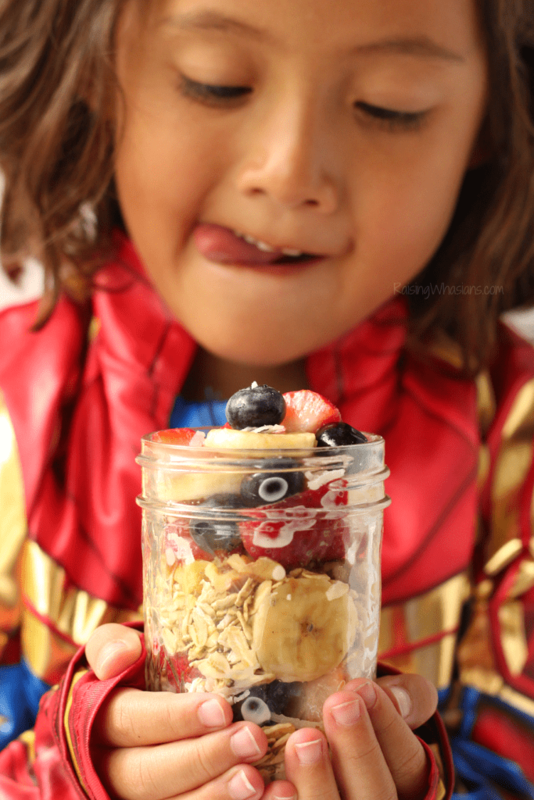 If you’re wanting to get your kids super charged with healthy and delicious eating, check out these 4 Healthy Captain Marvel Recipes for Kids. 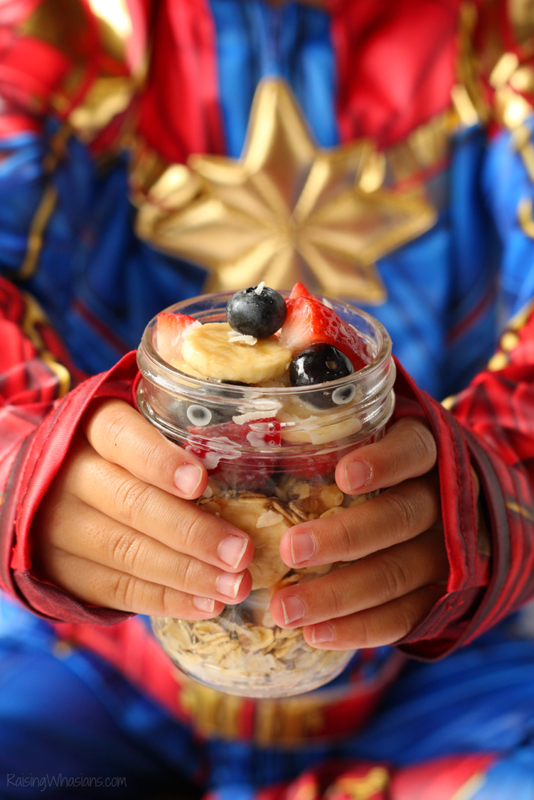 Inspired by Captain Marvel and Dole, these healthy meal ideas are packed with lots of kid-approved flavors for breakfast, lunch, dinner and dessert! She’s becoming more and more independent every day. And lately, she has a few (hundred) opinions about what she likes and doesn’t like to eat. Getting her to eat healthy? It’s like battling Captain Marvel some days. But using her favorite super hero as inspiration, I definitely can encourage my daughter to eat just like Carol Danvers. 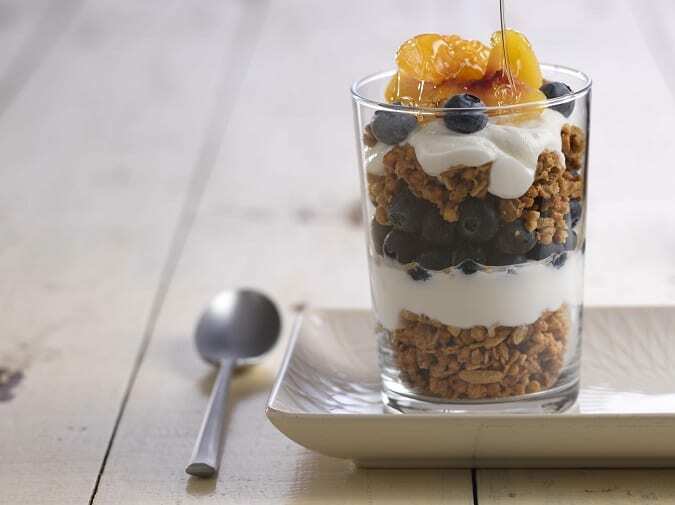 Breakfast, lunch, dinner or dessert, these Healthy Captain Marvel Recipes for Kids can help pave the way to super hero strength for years to come. Let’s start with the most important meal of the day. Want to start your day with a powerful Captain Marvel photon blast? 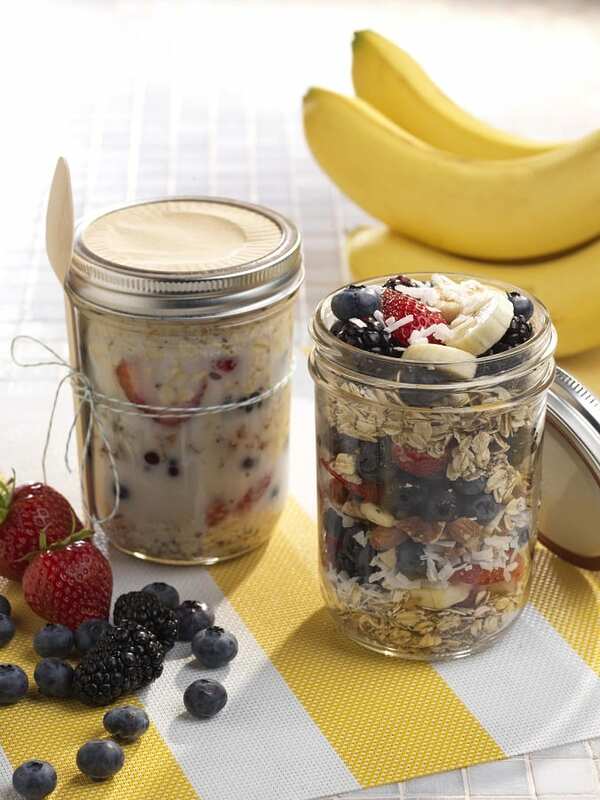 Try this amazing Wake Up Oats recipe. Fresh berries, nuts, oats, almond milk and crushed chia seeds really pack a punch of energy into your kids in the morning. I love how these overnight oats are easy to make the night before too – because that morning rush is real, y’all! Pasta night just got a super hero upgrade! This Vegetable Lasgana recipe is the perfect meal idea for your hungry kids. Easy to make with no boil pasta and filled with lots of delicious veggies for the nutrition they need. Don’t forget the cheese too! My family absolutely loves stir fry! 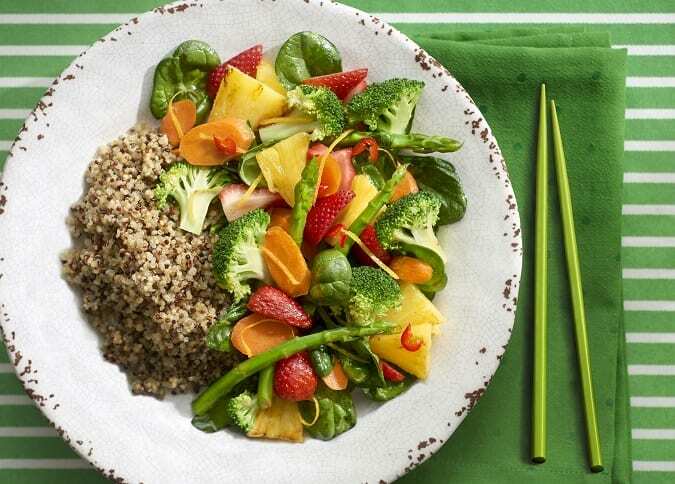 With fresh flavors of spring underway, this Lemon-Ginger Spring Vegetable Stir Fry recipe has a bunch of bright flavors to energize their super hero strength. I love the addition of DOLE® Tropical Gold® Pineapple for sweetness in every bite. Don’t worry. I didn’t forget about dessert. 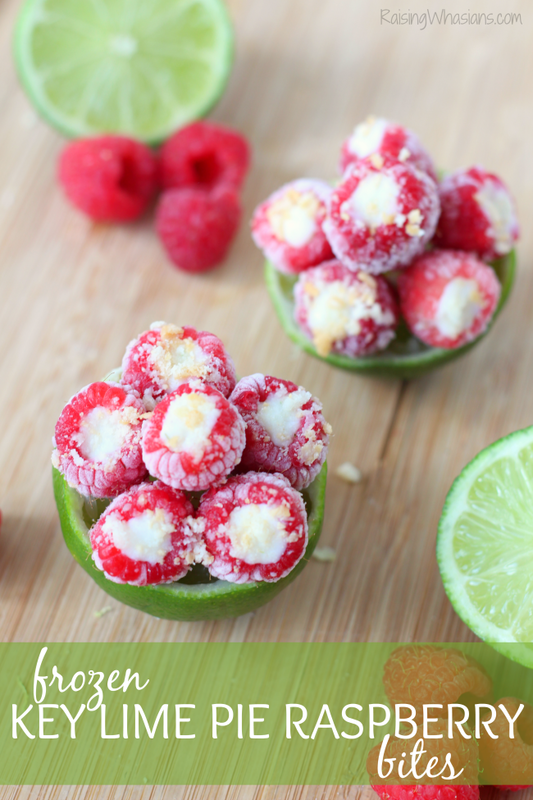 These Berried Treasure Yogurt Cups are a sweet way to end a super meal. The DOLE® Peaches remind me of the gold star in the middle of Captain Marvel’s suit! Don’t you think? Getting our kids to eat healthier can be challenging. 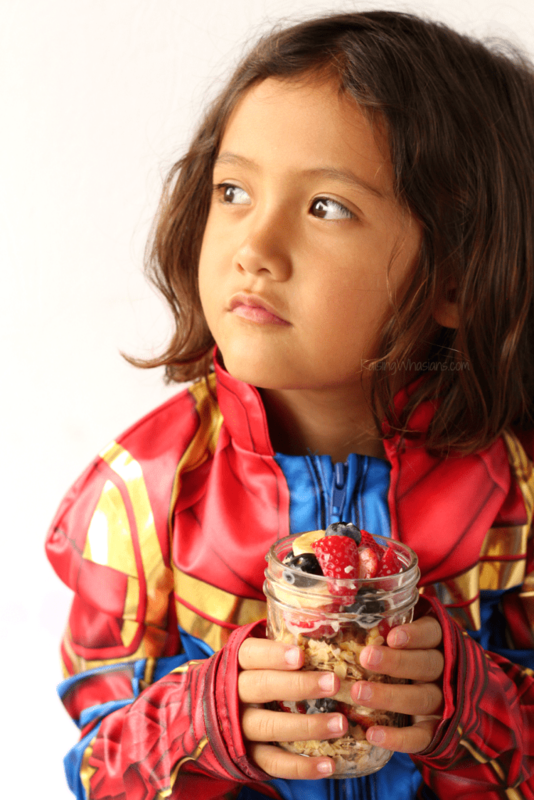 But with a little super hero help from Captain Marvel, Dole, and these 4 Captain Marvel Recipes for Kids, I think we’re on our way to out-of-this-world healthier eating habits. Now to get this little super hero to put her laundry in the hamper…that’s another story. Do your kids love Captain Marvel? 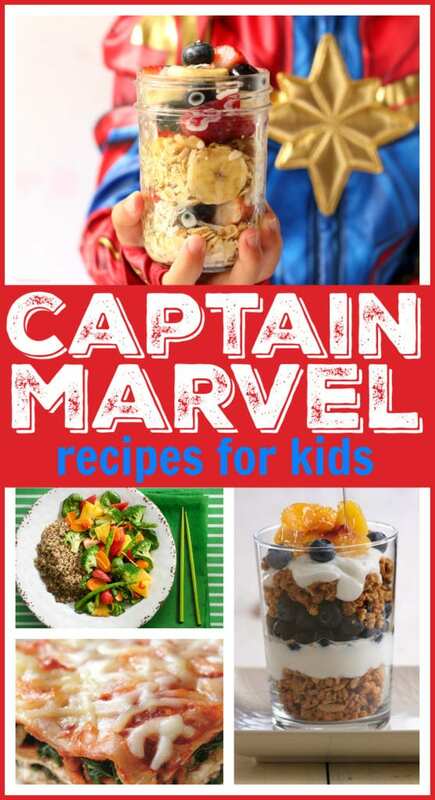 Which of these healthy Captain Marvel Recipes for Kids is your favorite? Be sure to follow Raising Whasians via Facebook, Twitter, Google, Instagram, Pinterest and YouTube for more easy recipes, favorite kids crafts, parenting moments and family travel tips. Looking for more delicious healthy kid-inspired recipes?